Hybrid engines in drill rigs that use bi-fuel technology are more efficient than their pure diesel or natural gas counterparts. The engine works by consuming diesel fuel during initial acceleration, then switching to the natural gas once the vehicle reaches a steady speed. This system leads to greater fuel economy, which decreases the price for vehicle operators to fill-up at the pump. Distribution of natural gas to diesel is upwards of 70 percent, meaning that vehicles need only need 30 percent diesel fuel to run. The reduction in the more expensive and heavier fuel reduces the need for massive on-site fuel storage for commercial vehicle hubs and machinery. Removing the average $3 per gallon cost of diesel fuel from the equation represents a significant cost savings. Drilling and fracturing operations that use bi-fuel systems can cut their fuel expenses for operating heavy machinery. 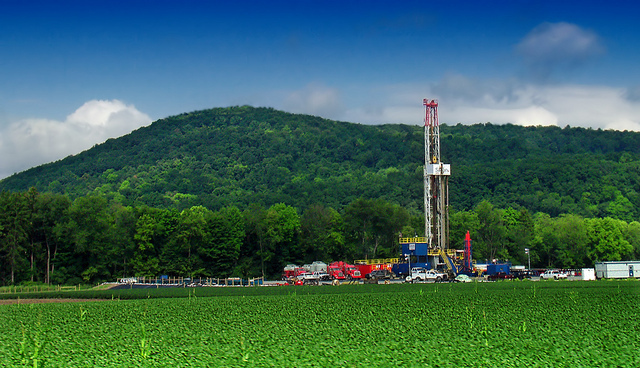 These companies are under intensive pressure to control costs, particularly in natural gas plays like the Marcellus Formation, where competition is high for land rights. By leveraging the field (pipeline) gas already available at the dig site, companies can get roughly five percent in reduced fuel costs provided that the mixture of natural gas to diesel is at least 50 percent mixture. Using conditioned field gas is environmentally positive because it burns cleaner than other fuels and in abundance at the source. Achieving true cost savings for oil and gas operations with a switch to bi-fuel engines depends on a number of factors, including replacing older, diesel-based generators and engines. Fortunately, companies are able to retrofit the outdated models with bi-fuel technology. A drill rig operator can save as much as $400,000 per year in fuel cost when augmenting a three-engine drilling rig with bi-fuel capability. Installation takes about three days — lightning speed in the natural gas drilling and fracturing industries. Access to natural gas is crucial to make this plan work, which is why some companies have used blends of ethane and propane to supplement fuel sources when natural gas supply is low. This strategy helps keep up engine power and performance as drill rigs continue to wean off of diesel. Investing heavily in natural gas and bi-fuel components is a significant cost investment for any drilling or fracturing company. Any variance in equipment life from using bi-fuel systems could result in financial losses in millions of dollars. Good thing inspectors have found no evidence that bi-fuel reduces engine or generator life in any way. The equipment can’t tell it’s using a mixture of natural gas and diesel fuel, even after 10,000 hours of continuous use. Many bi-fuel kits installed on existing diesel rigs in the mid-2000s are still running today without a problem. The bi-fuel system also mitigates horsepower issues that can affect performance for spark-ignited engines running on pure natural gas fuel. Introducing diesel at the compressor stroke’s end allows it to blend with natural gas fuels, which exist at lower temperatures in the vapor phase. This delivery system is vital for rigs working in oil and gas shale fields, particularly hydraulic fracturing ventures. Research estimates that only 8,000 hydraulic fracturing pumps use bi-fuel technology, as of 2013. With more positive studies coming out every month about system performance, that number is likely to shift drastically in the coming fiscal quarters. Diesel is among the “dirtier” fuels available because of its low combustion temperature. The addition of natural gas to the fuel mix, which has a higher ignition temperature, leads to a reported reduction in nitrogen oxides and particulate matter that were the hallmarks of pure diesel engines of the past. There’s also a reduction in the emission of sulfur oxides from bi-fuel, due to the reduced presence of diesel. Researchers estimate the total current reduction in environmentally harmful emissions is anywhere from 25 percent to 70 percent with bi-fuel systems. As engineers produce bi-fuel engines and generators with greater fuel efficiency, these already smaller amounts of nitrogen and sulfur oxides are likely to decrease further. Field reports from rig operators of bi-fuel equipment also noted that the engines ran quieter than equipment using 100 percent diesel fuel. Regular unleaded gasoline for automobiles requires heavy refining to make it suitable for combustion. That’s not the case with field gas, which can need very little refining for bi-fuel engines to use effectively. This is particularly true of field gas pulled from the Marcellus Formation. This “drier” form of natural gas needs a small amount of processing to cut pressure from the well’s pipeline. Drilling companies can outfit a truck with the necessary equipment that then becomes a kind of mobile filling station for rigs. Buying new bi-fuel engines and generators may have a higher initial cost than retrofitting, but their safety features save money in the long run. Modern drilling systems like the EVO SP come standard with digital temperature sensors, flame detection technology, gas temperature monitors, and combustible gas detection. These systems can help prevent catastrophic system failure before it ever starts by giving advance warnings temperature fluctuations and valve knock. A responsive electronic control unit (ECU) gives feasible data in real-time with sensors conducting safety checks 50 times every minute. Achieving greater efficiency for shale drilling or fracturing operations is key to longevity in this industry. By switching to bi-fuel engines and generators now, companies can start controlling costs more effectively and sooner — thereby reducing strain on their revenue streams. Join the discussion. How do you expect bi-fuel will change the industrial world? Share your thoughts in the comments section below.